No matter what industry you're in, being a business owner or a part of the professional world means you're exposed to a variety of concepts, opportunities and events that will expand your professional network, expose you to potential customers and business connections, or enhance your company itself. When you're looking for ways to build professional expertise or better your business network, hosting or attending events like expos, conventions, conferences and trade shows are excellent avenues for expansion —but all these business-related events can become a bit muddled in your mind if you're new to the game. If you haven't attended one of these professional events before or have trouble pinpointing the difference, we're here to help you understand. Knowing what to expect means you'll be able to prepare properly by bringing the right materials and team members to be poised for professional success. Here's our guide to differentiating among important business marketing events. Also called trade fairs, expos or expositions can be small- or large-scale events in which businesses and companies in a specific niche come together to showcase their services and products or promote new business developments. 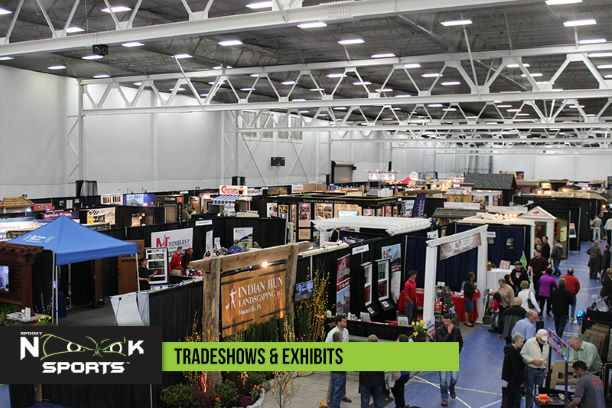 When you attend an expo to promote your business, you should be prepared to demonstrate your products, explain your services and answer questions about how your company works, as well as make connections with similar companies or those you can work with. Expos are similar to trade shows, so you may want to set up a booth to display your products and features. The best type of expo halls will have sufficient room for plenty of businesses to put their information and offerings on display. Similar to expos, trade shows events are product fairs where companies in the same or similar industries demonstrate and showcase their new offerings. Characteristics of a great trade show include a variety of booths and companies exchanging ideas and information. This business event is a great setting for finding new clients and partnering with other companies. Typically focusing on a specific industry, society, political party or members of a particular organization, conventions are large-scale meetings or promotional events that offer a formal community experience and the chance to network. If you're wondering how successful conventions work, make them work for you. Come prepared with an attention-catching convention display or by setting up a noteworthy convention booth. You'll get the chance to meet like-minded professionals and explore your potential in your business sphere. Similar to conventions but more formal, conferences are professional opportunities to exchange education and information through a consultatory setting with a formal agenda. This is the kind of event you would attend to develop further industry knowledge, learn current practices or developments, and have professional discussions with people in your industry. Features may include key-note speakers and presentations. Interested in attending or holding a successful conference, convention, trade show or expo? Nook Meetings & Events offers the perfect venue for any kind of event. With 700,000 square feet of space, 135 on-site rooms, accommodations for up to 10,000 people and a host of amenities — including our catering and team-building activities, on-site restaurant and luxury hotel — we'll help you have an event experience to remember. Learn more about our offerings and event space today.